Oftentimes, most of us are functioning in permanent overdrive and this can have detrimental effects on our health. Stress overload can lead to health problems, which all too often shows on the skin. Body Tune is a spa and massage therapy center that promotes physical wellness. Aside from the massage therapy it is known for, Body Tune now offers top of the line skin care services to cater to its growing clientelle. Mommy bloggers were recently invited and given the chance to preview Body Tune's latest anti-wrinkle treatment offering--Ultra Lift. Do you notice the first signs of ageing on your skin? Stress hormones like cortisol decrease the muscular tissue beneath the skin making it thinner, looking wrinkled and old. The wrinkles and the eye-bags alert you the level of collagen and elastin that you are losing from your body. 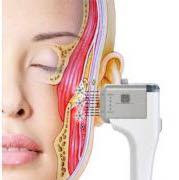 The latest technology in non-surgical facelift, Ultra Lift, powered by state-of-the-art high intensity focused ultrasound [HIFU] cause delicate lessions on the 4th layer of the skin and cause thermal coagulation. ULTRA LIFT (HIFU) targets the SMAS (Superficial Muscular Aponeurotic System) at a depth where significant skin tightening and rejuvenation happens. During the healing process, the skin produces collagen and elastin, making the skin muscle elastic and causing the wrinkle to tighten gradually over time. Tightened skin looks young and vibrant! The Ultra Lift device gives effective, safe and painless skin tightening in the different areas of the face including the Forehead, Cheeks, Chin, Mouth, Neckline, Jowls and even the baggy under eye! Make it a habit to keep yourself in top condition. Visit Body Tune soon and bring yourself back to a fresh state of mind and body.